February 14th is just around the corner ladies, so it's time to start gearing up with some festive manicures. Valentine's Day is probably the easiest holiday to prepare manicures for for several reasons. A) I can't think of a single girl who owns nail polish that doesn't have a pink, red, or purple in her collection. B) Hearts are the easiest thing to create, besides dots. They're basically just three dots, strategically placed. C) Cute is easy to do. 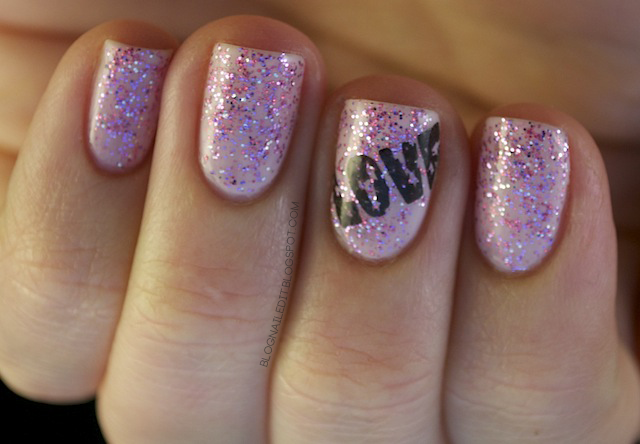 My first act in this series of pinks and cutes is a simple stamp over some girly glitter. I started this off with Heavenly (Savina), and then added one thinnish layer of Candy Cane (Color Club). After sorting out the stamping plates that would go well with the colors and theme, I finally landed on one I was almost sure I'd never use, but actually quite like. Bundle Monster's BM09 plate has this sort of tattered "LOVE" stamp, so if any imperfections arose as a result of the transfer, no one's the wiser. It also grits up this glittering manicure a bit. Black on Black (Sinful Colors) stamps lovely though, so I imagine there aren't too many issues.I should have stamped it facing the other way for photographic purposes, but the unusual post-production rotation will have to suffice. This is so girly and cute!!!! I really like the glitter you used.